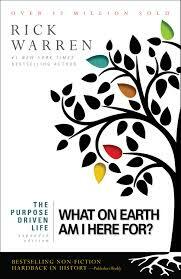 The Purpose Driven Life: What On Earth Am I Here For?, Expanded and Large Print Edition, by Rick Warren and published in 2002 by Zondervan. I am going to have to begin this review with two stories. F irst story: I never intended to read this book. As a protestant, evangelical Christian, I come across it all the time, but, like I said, I never intended to read it. Why? It’s pretty simple, if not a bit strange. First, the title. Anyone else think it sounds like a bad, self-help, motivational book? Second, I have a very hard time connecting with Rick Warren. Again, as a protestant, evangelical Christian, I come across Rick Warren all the time, and not least of all because I am involved with Celebrate Recovery, a 12-step program started by his church in California, whose curriculum is heavily influenced by him. Let me be clear: I have nothing against him. We just don’t think the same. Half the time he asks a question and I don’t know what he’s asking, or he uses some teaching technique that just doesn’t work for me. We’re on different pages, mentally. I was only somewhat surprised, then, when I went online to purchase the book and (no joke) couldn’t figure out which version was which and what exactly I wanted to purchase. It seems he has updated the old version, and in so doing, didn’t just change the cover, but also made the old subtitle more prominent than the old title. That, and there are numerous books related to The Purpose Driven Life; like journals and curriculum for small groups. Utterly confused, I ended up buying the ONLY edition that stated clearly in the synopsis that it was, indeed, the updated version on The Purpose Driven Life. It arrived in the mail and, much to my chagrin, was the large print edition. Sigh. Second story: If I am going to be reviewing Christian (and other religious books), it is going to be apparent that I am a Christian, or at least you should be disclaimed of it. This is what that means to me. I grew up in the church (namely The Salvation Army), and my great aunt was a minister. We were oftentimes in the church building, and I was active in the choir, the Sunbeams (think Christian Brownies) and Girl Guards (think Christian Girl Scouts), as well as Junior Soldiers. I prayed what is known as the sinner’s prayer at age four, and asked Jesus to forgive my sins and come be my Lord. I have had years of doubt and of struggle and pain over the past thirty years, but God has remained my God and I still believe wholeheartedly that Jesus is His son and the Bible is His revelation (and everything else in the Nicene Creed). God, Jesus, and the Holy Spirit are a part of my daily life, my relationships, and my family life. My passions include meeting others in their needs and struggles and telling them about the freeing love and forgiveness of the Creator of the Universe. If you did not know, only just over ten years into its being, The Purpose Drive Life is the best-selling hard-back book in all history. It has spawned a business, a curriculum, and a number of co- materials. I’m not exactly sure who is reading it, but I’m going to venture that a large portion of them are evangelical Christians. So now that we know that this book is not a poor, self-help book, what is it? It is nonfiction. It is religious. The main question of the book is, of course, “What On Earth Am I Here For?” And the book answers that question to the tune of five purposes that mold into one. Of course, it does this from the standpoint of protestant Christianity, and using Biblical scripture. It covers a lot of ground very quickly, but somehow cuts to the quick in many of the areas it addresses. In a way, then, it’s a primer for the Christian life, working with the Bible as a modern day manual or guidebook that addresses the most basic of operational questions. Having grown up as both an academic and a Christian, I didn’t expect this book to hold a whole lot of “aha” moments for me. I also expected that it would be written… well… woodily. Happily, neither of these assumptions proved to be true. It is a book that you could come back to time and time again and glean things from. Even if not a Christian, there are certainly wise things to be read here, but taking only those things would completely miss the point of the book. Because, in the end, this book is not for the faint of heart. If one were to accept his premises (and what basic premises they are), it would require a radical makeover (for almost all of us). So I would recommend this book for Christians of all stripes and maturity, for people looking for the meaning of life, and for people wondering if they believe in God/Jesus. If you like it/believe it, it could change your life. And as a note, it is written to be read in sections for forty days. This would be a good way to do it (or in a group, as suggested) but I was reading faster since I was reading it for review. “The most common myth about money is that having more will make me more secure. It won’t” (p39). “…one key of failure is to try to please everyone (p39). “The power of focusing can be seen in light. Diffused light has little power or impact, but you can concentrate its energy by focusing it. With a magnifying glass, the rays of the sun can be focused to set grass or paper on fire. When light is focused even more as a laser beam, it can cut through steel (p43). “Life on earth is a trust” (p58). “The ultimate goal of the universe it to show the glory of God. It is the reason for everything that exists, including you” (p71). “When anything in creation fulfills its purpose, it brings glory to God” (p73). “Living the rest of your life for the glory of God will require a change in your priorities, your schedule, your relationships, and everything else. It will sometimes mean choosing a difficult path instead of an easy one” (p75-76). “One of the greatest gifts God has given you is the ability to enjoy pleasure. He wired you with five senses and emotions so that you can experience it. He wants you to enjoy life, not just endure it” (p82). “Every act of enjoyment becomes an act of worship when you thank God for it” (p96). “Sometimes it takes years, but eventually you discover that the greatest hindrance to God’s blessing in your life is not others, it is yourself–your self-will, stubborn pride, and personal ambition” (p107). “To instruct us in candid honesty, God gave us the book of Psalms–a worship manual, full of ranting, raving, doubts, fears, resentments, and deep passions combined with thanksgiving, praise, and statements of faith” (p123). “Great opportunities may come once in a lifetime, but small opportunities surround us every day” (p125). “Will I use my energy and emotions for retaliation or for resolution? You can’t do both” (p183). “It is a sacrifice to patiently absorb the anger of others, especially it it’s unfounded. But remember, this is what Jesus did for you” (p201). “For the sake of fellowship, you must destroy your arsenal of relational nuclear weapons, including condemning, belittling, comparing, labeling, insulting, condescending, and being sarcastic” (p203). “Many are afraid to commit to anything and just drift through life. Others make halfhearted commitments to competing values, which leads to frustration and mediocrity. Others make a full commitment to worldly goals, such as becoming wealthy or famous and end up disappointed and bitter” (p230). “We miss many occasions for serving because we lack sensitivity and spontaneity” (p331). “Jesus specialized in menial tasks that everyone else tried to avoid: washing feet, helping children, fixing breakfast, and serving lepers. Nothing was beneath Him, because He came to serve. It wasn’t in spite of His greatness that He did these things, but because of it” (p333). “At some point in your life you must decide if you want to impress people or influence people” (p355). “God has never made a person He doesn’t love. Everyone matters to Him” (p377). “The expectations of others will box you in, limit your potential, and keep you from fulfilling the dream God placed in you heart to fulfill” (p427). “…there will always be those who will demean how you look, dislike what you do, disapprove of what you believe, dispute what you say, and disrespect who you are. But they cannot control your emotions unless you let them” (p432). I love the stories at the beginning – they both add great perspective to the review. The quotes are also a nice touch!